I'm a big fan of family traditions, especially around this time of the year. 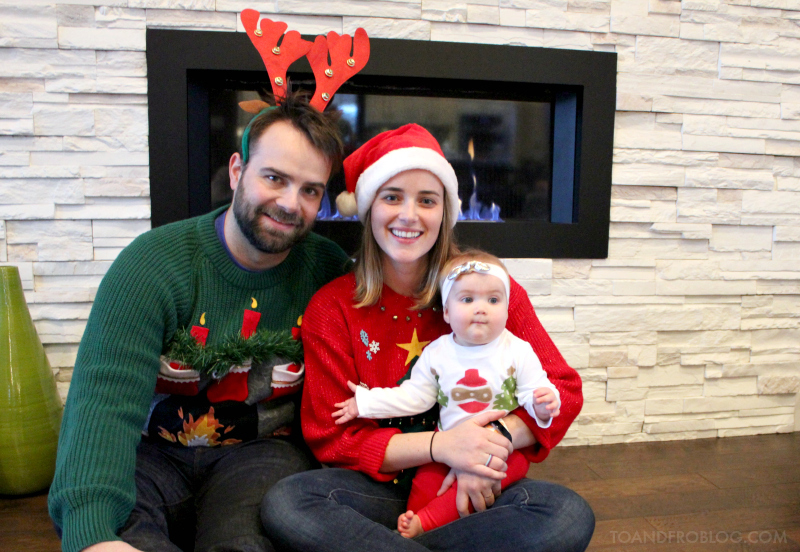 During the holidays, one of our favourite traditions is wearing our ugly Christmas sweaters. The uglier the better. In the past decade, the ugly Christmas sweater trend has picked up some serious steam. What was once reserved for your elementary school teacher (sorry teacher friends), is now a must-have fashion item during the holiday season. With the popularity of ugly sweater parties on the rise, vintage and second-hand stores such as Goodwill and Value Village, and even more mainstream stores like H&M, are all on board with ugly sweater trend. Planning on attending an ugly sweater party this holiday season? To ensure you don't create a fashion faux pas and show up wearing the same sweater as someone else, why not make your own?! Thrift stores are a great source for those big red and green sweaters, and craft stores such as Michaels, Jo-Ann Fabrics, and even your local Dollar Store, have all the bells and whistles needed to make it as tacky as possible. 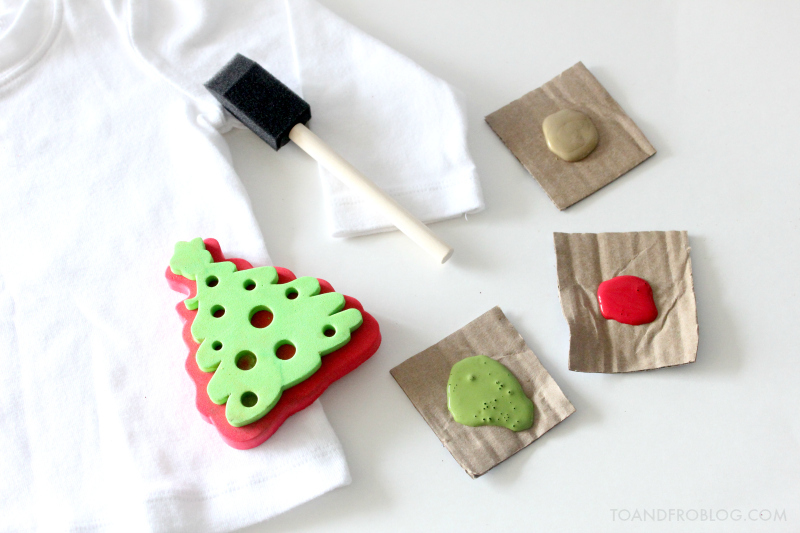 We had a blast making ours a few years ago, and they are still a huge hit whenever we dust them off pull them out of the closet during the holidays. This year, we wanted Morley to be a part of our annual Christmas tradition. But, instead of shelling out a fortune on a sweater she would wear one or twice, we decided to make her her very own unique ugly sweater. Since baby is at the stage where she puts everything and anything she comes across into her mouth, it is not safe to add all of the bells and whistles to baby's sweater like we did for our own. Case in point, she ripped all of the bells off my sweater above before attempting to shove them in her mouth. 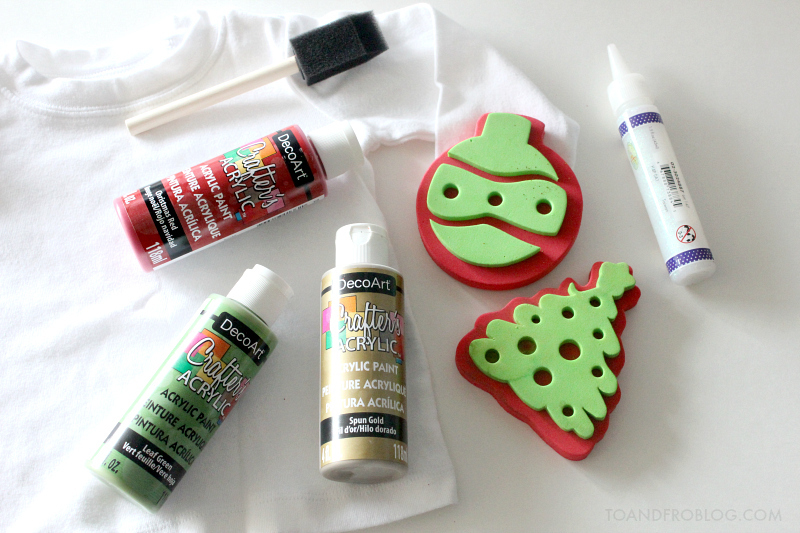 Instead, we used paint and a few festive stamps to "tackify" the sweater. 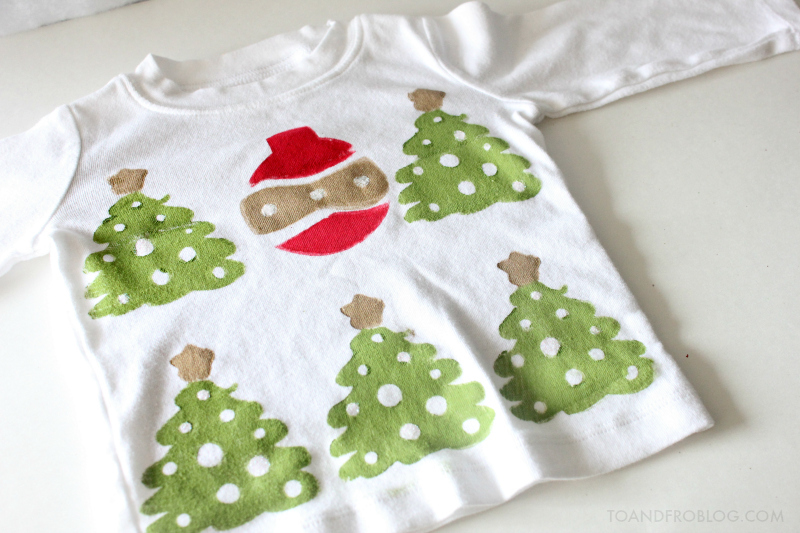 It was simple, inexpensive, festive, and most importantly, super cute! If you're looking to make an ugly sweater for either yourself or your family, check out this simple and inexpensive ugly Christmas sweater tutorial. Pre-wash your garment. If needed, iron to remove any post-wash wrinkles. The white long-sleeved shirt that we used was part of Morley's Halloween costume (that she'll never wear again), but I also bought a few from Walmart for around $4 each. I recommend using white, or another light colour, so that the paint really pops. Make sure that whatever type of garment you chose to decorate, it is weather-appropriate. Lay clothing on a flat surface, and insert piece of cardboard between the front and back layers. This is to prevent the paint from bleeding through the clothing, and to also give you a flat surface for your stamp or stencil. I purchased the acrylic paints (red, gold and green) and glitter glue at my local Dollar Store. 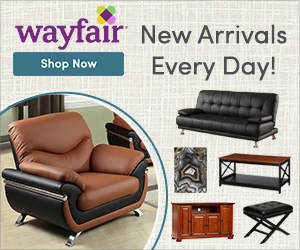 You can you any type of paint you chose, including fabric paint. I chose to use acrylic paint because it is widely available in several colours and extremely affordable. While it did hold up in the wash, I also knew that Morley would not be wearing this more than a few times during the season. 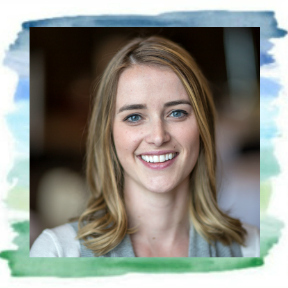 Tip: Instead of having to clean a plate or container once you're done with the paint, put the paint on a piece of scrap cardboard or in an egg carton. If using stamps, paint the bottom of the stamp with the desired colour. Pull clothing tight and flat where you would like to place the stamp. 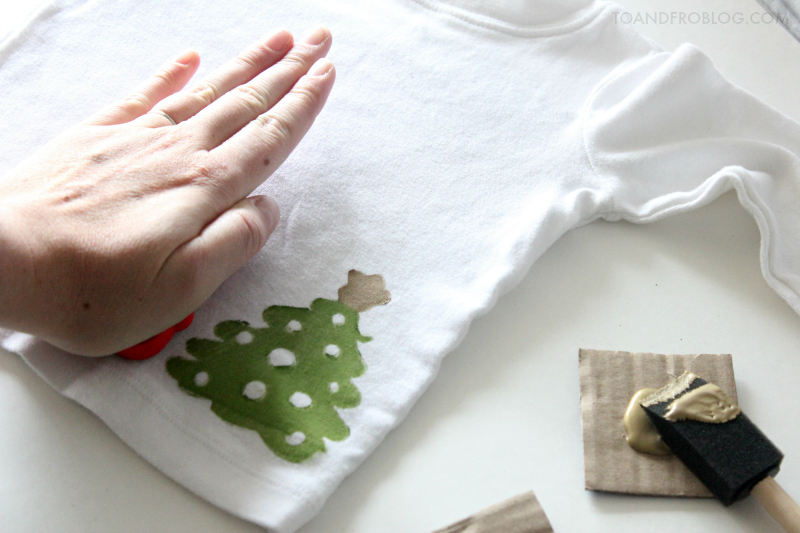 Press stamp onto clothing firmly and hold for at least 10 seconds to ensure a proper paint transfer. If the paint colour is too light after one stamping, repeat. Once you have finished painting, leave the garment on a flat surface to dry for at least 24 hours. 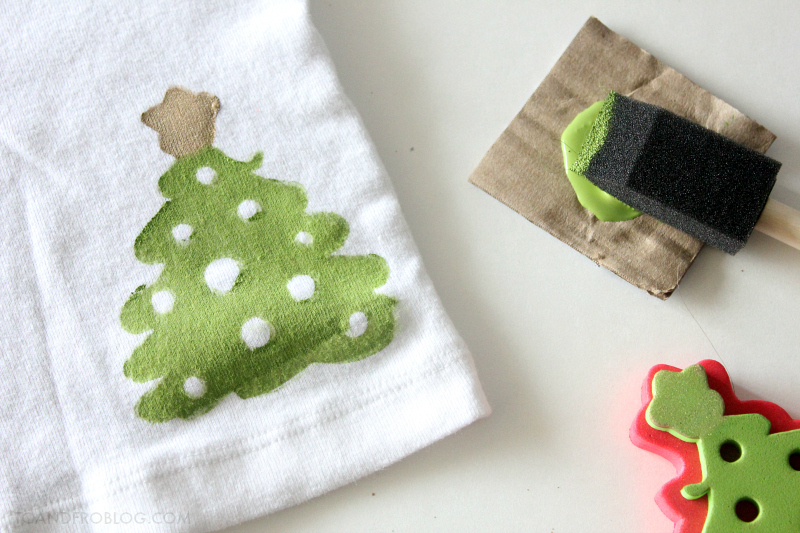 Once the paint is dry, add any glitter paint, if using. Allow to dry for another 24 hours. If you're feeling especially festive, why not also decorate pants for baby to make a truly ugly Christmas outfit! If baby will be wearing the sweater more than once, I recommend hand washing. However, it is washing machine and dryer safe. It may not be the prettiest Christmas sweater on the block, but isn't that the point of an ugly Christmas sweater? It's bright, it's tacky and, most importantly, it's festive, so little miss Morley can now join in on our annual Christmas tradition. 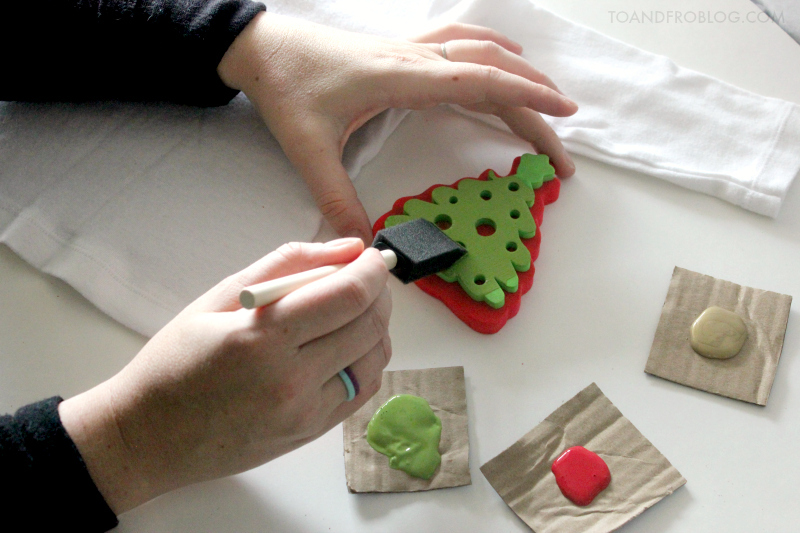 What are some of your fun holiday traditions?